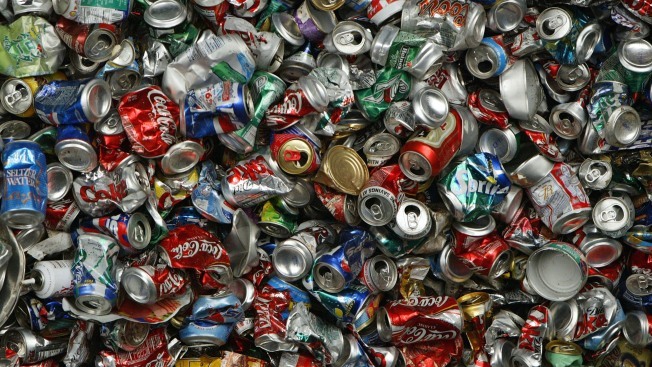 Recycled aluminum cans are seen at the Norcal Waste recycling facility July 11, 2003 in San Francisco. A can collector whose graffiti-covered, recyclables-filled car is an unwelcome fixture in her Brooklyn neighborhood reportedly owns more than $8 million in New York City real estate. Lisa Fiekowski spends much of her free time collecting cans, which she packs into her 1993 Toyota Camry, the New York Post reported. But her can-collecting is just a hobby she uses to get exercise, not a hustle she needs to make money, she told the outlet. The self-described “old-fashioned bohemian” owns a $1 million co-op near Prospect Park, as well as at least three properties in Harlem, according to the outlet. Her husband, meanwhile, earns around $180,000 a year in a job with the city. Fiekowski, who has an MBA from Chicago University and has worked as a marketing analyst and a stockbroker, bought a one-bedroom apartment for $22,000 when she moved to New York in 1979, she said. She told the Post she started investing in real estate in the mid-80s. Neighbors and family members don’t appreciate her hobby or her can-filled car, which they consider to be an eyesore, she said. Reactions to her hobby and her vehicle reflect the ways in which New York has changed over the years, she maintained.